0710/25 S5 - Blue Champagne Cooler by Riedel. 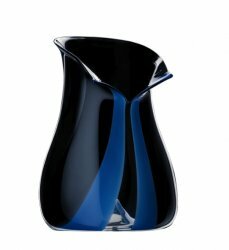 Similar to the style of the Black Tie, tuxedo collection by Riedel, this Blue Champagne cooler is designed with stripes of blue glass. With a thumb-sized area at the base of the cooler for easy handling, this feature also allows for equal weight distribution on the wine bucket, when inserting a bottle of wine into the ice.